Polly's Beak Buffer provides birsds the opportunity to rub their beaks. 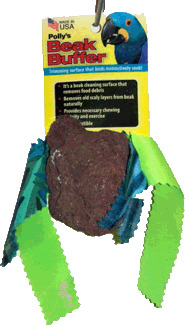 This will help remove food debris and prevent over growth f the beak. This lava rock will easily attach securely to the side of the cage and cotton fabric is added to attract birds.